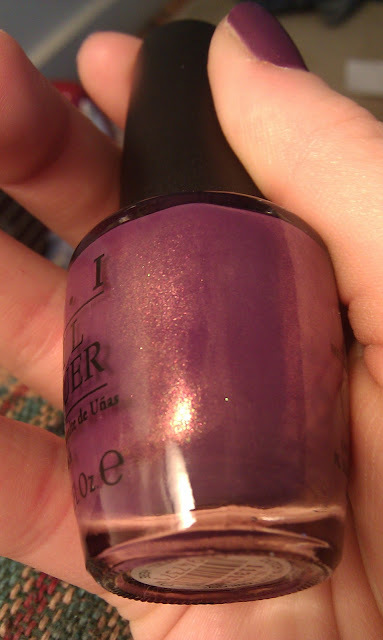 Let There Be Lacquer: Untried 2: OPI Dutch Ya Just Love OPI? Gotta love a lopsided picture to start off the post! Today I am featuring OPI Dutch Ya Just Love OPI? for my 2nd untried. This polish came out this spring as a part of the Holland Collection. This medium/dark purple is a great shade on it's own. My favorite part is the golden/red shimmer you see in the bottle. Unfortunately, the pictures I have aren't showing off the shimmer on the nail like I hoped. You can never go wrong with a purple and a shimmer in one right? 2 coats Dutch Ya Just Love OPI? No top coat. I was just looking at this collection in the store the other day. Color looks nice on you.